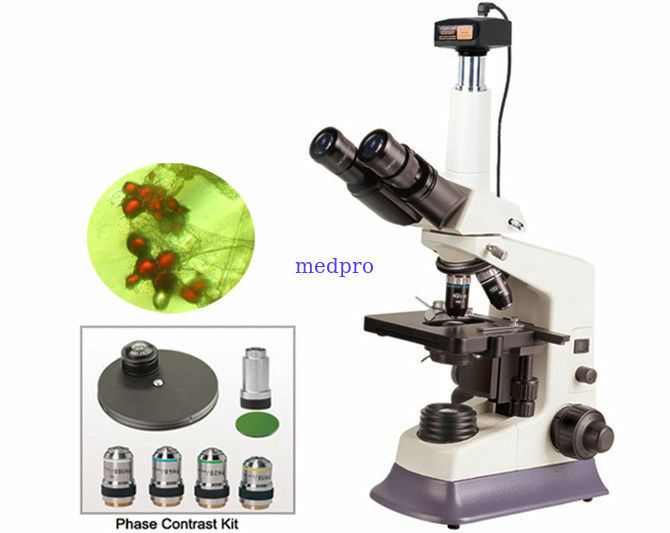 The External Digital camera phase contrast microscope BM180PHT with 5.0MP is made up of the biological sliding phase contrast microscope BM180PHT and professional high resolution 5.0MP digital camera with USB2.0 connection, The included 5.0 mega pixel camera comes with basic measuring software that allows image capture and this kind of external digital microscope is more flexible compared to the build-in or integrating digital camera microscope. The external digital microscope lends greater flexibility - you can add different cameras on the same microscope and vice versa. And the digital camera could be added on other regular microscope too. And it is more convenient.It is Compatible with Windows XP/Vista/7/8, Mac OS X and Linux, its multi-functional user-friendly software allows you to preview live images, record videos, capture still pictures, edit captures, or save them in BMP, TIFF, JPG, PICT, PTL and other formats very easily, as well as conduct length, angle, area, and other measurements. It is a perfect laboratory instrument for clinics, Vets, Doctors, and professional students and so on. AC220V/110V, Super Light 3W LED illumination, Brightness Adjustable. AC220V/110V, 6V20W, Halogen Lamp, Brightness Adjustable.